Four wheel driving is an exciting way to get outdoors and see some of Australia's beautiful landscapes. A four wheel drive trip can be as simple or technical as you desire and there are a range of four wheel drive (4WD) tours available. 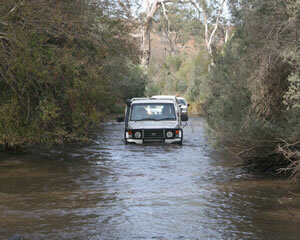 Experience a 4WD trip in Brisbane, Sydney, Perth, Melbourne, Adelaide and Hobart. 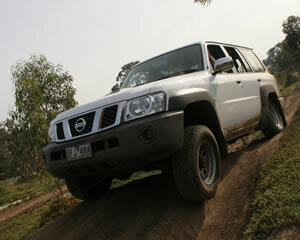 Four wheel driving in Northern Territory is also an amazing experience. Fraser Island 4WD trips and at other regional locations are also terrific fun. Whether you're into 4WD driving or just looking to have some fun in someone elses 4WD Drive, then there is an adventure for you. 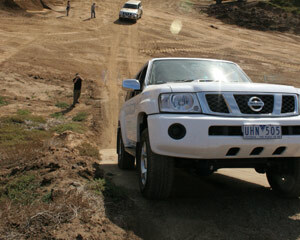 Enrol today in a 4WD trip or package and experience all there is to offer from four wheel driving. This tour is the market leader in one day adventure travel to Fraser Island. We're committed to giving you the very best Fraser Island experience while travelling in our luxury Landcruiser 4WD. Give us a day....we'll give you memories for life! Departing daily from Brisbane, our one day tour visits Rainbow Beach, Fraser Island as well as Lake McKenzie or Birrabeen. During the day, enjoy lunch at a local resort, visit a World Heritage Rainforest and 4WD on 75 Mile Beach. This action packed 4WD tour highlights the pristine beauty of Moreton Island National Park. Explore the spectacular beauty of Moreton Island on this full day 4WD Eco Adventure and visit places such as Cape Moreton Lighthouse, Blue Lagoon, Honeymoon Bay, North Point and Open Beach. A 4WD adventure to the beautiful Moreton Island - a true wilderness destination. Discover this paradise just a short sea ferry journey across Moreton Bay from Brisbane. Moreton Island is the third largest sand island in the world - 98% of which is national park. This action packed 4WD tour highlights the pristine beauty of Moreton Island National Park. Experience two of the most popular activities on Moreton Island! Snorkel or Kayak around the magnificent Tangalooma shipwrecks, and reach speeds of up to 50km/h sandboarding at The Desert! This AAT Kings 4WD safari takes you through the West MacDonnell Ranges to Hermannsburg, an Aboriginal community. Travel down the bed of the Finke River into Palm Valley and see spectacular rock forms, white sands and an oasis of rock pools and palm trees. Explore the Kimberley in comfort and style on a small group 4WD safari. With a maximum of 7 passengers, travel in a luxury 4WD to the Bungle Bungles, Mitchell Falls, the Gorges of the Gibb River Road, Lake Argyle and El Questro. Includes 2 helicopter flights & a cruise. Our tours are unique in Tasmania because not only do we take you to the places you have heard about, such as Cradle Mountain and Wineglass Bay, we take you to remote, lesser known areas. Many of the places we go can be accessed by 4WD only. Explore the Kimberley in comfort and style on a small group 4WD safari. With a maximum of 7 passengers, travel in a luxury 4WD to the Bungle Bungles, Mitchell Falls, the Gorges of the Gibb River Road, Geike Gorge and El Questro. Includes 2 helicopter flights and a cruise. Explore the Kimberley in comfort and style on a small group 4WD safari. With a maximum of 7 passengers, travel in a luxury 4WD to the Bungle Bungles, Mitchell Falls, the Gorges of the Gibb River Road, Geike Gorge,El Questro and Nitmiluk Gorge. Includes 3 helicopter flights & 2 cruises. This is the ultimate camping discovery tour combining the Kimberley and NT, covering many of the major tourist attractions on the way. Highlights include Windjana, Bells and Manning Gorges, Mitchell Plateau, El Questro, Bungle Bungles and Katherine Gorge! Explore the Kimberley in comfort and style on a small group 4WD safari. With a maximum of 7 passengers, travel in a luxury 4WD to the Bungle Bungles, Mitchell Falls, the Gorges of the Gibb River Road, Geike Gorge, Lake Argyle and El Questro. Includes 2 helicopter flights & 2 cruises. Find out what rally driving is all about as you take a Subaru WRX for a 12 lap spin around our rally track! Under the guidance of your instructor you'll let loose on the dirt rally track and take the Subaru spinning around corners. Imagine dirt flying, engines revving and loads of rally driving fun! Explore the Kimberley in comfort and style on a small group 4WD safari. With a maximum of 7 passengers, travel in a luxury 4WD to the Bungle Bungles, Mitchell Falls, the Gorges of the Gibb River Road, Geike Gorge, Lake Argyle, El Questro and Nitmiluk Gorge. Includes 3 helicopter flights & 3 cruises. This tour incorporates all of the major icons of the Kimberley that are the real pearls. Broome,Cape Leveque, Gibb River Road, Windjana, Tunnel Creek, Manning and Galvins Gorges. Drysdale Station, Mitchell Falls, ElQuestro, Kununurra,The Bungles National Park, Geikie Gorge Cruise, finish Broome. This tour incorporates all the major icons of the Kimberley that are the real pearls. Starting in Kununurra, Visit the Bungles, Broome (2 free days), Cape Leveque, Gibb River Road. Windjana, Tunnel Creek, Manning, Galvins Gorges. Drysdale Station, Mitchell Falls, El Questro. Finish at Kununurra. 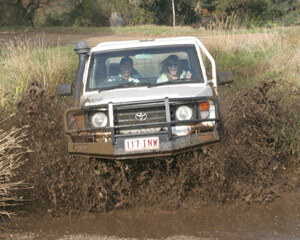 Spend 2 days exploring the main sights of Kakadu on a small group luxury 4WD Safari. Our knowledgeable guides will provide great insight to their local area. This tour is accommodated in the heart of Kakadu National Park and includes a sunset cruise. The Ultimate tour to Moreton Island. Small group tour incorporating 4WD eco tours, learn to surf , try fishing, snorkeling the Tangalooma Wrecks, sand boarding the huge sandhills. Overnight camping at Blue Lagoon. History,culture and eco-tours. Action packed! Starting in Kununurra, we travel to the world-renowned Purnululu National Park, where we will enjoy short walks while camping inside the National Park. Some may choose to take an optional helicopter flight over this natural wonder. Fitzroy River and Geikie Goege Cruise, tour finishes in Broome. North Stradbroke Island, the second largest sand island in the world. Our day tour explores the Coral Sea beaches of pristine white sand, wildlife and rich forests, wetlands and spring fed lakes. 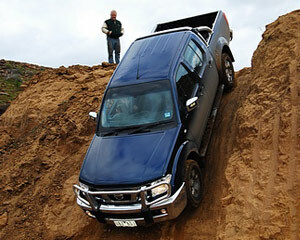 Know someone who has a 4WD but doesn't feel confident about off road driving? This course is designed for the driver who has minimal experience and who wants to learn the fundamentals of their 4x4. If you've never taken your 4WD off the bitumen, but would like to get off the beaten track, join us for a learning journey in off-road driving on a recreational course! Bring your own 4WD or use ours to help improve your skills by putting them to the test on our exclusive, purpose built 4WD circuit! The 4WD Challenge gets your team behind the wheel of big 4WDs across the terrain they were made for. Put the vehicles through their paces and tackle deep ditches and challenging water obstacles! Explore the Kimberley in comfort and style on a small group 4WD safari. With a maximum of 7 passengers, travel in a luxury 4WD to Mitchell Falls, the Gorges of the Gibb River Road, Lake Argyle and El Questro. Includes 2 helicopter flights & a cruise. Explore 5 days on the Gibb River Road and 2 days in the World Heritage area of the Bungle Bungles, seeing and exploring Windjana, Bells Gorge, Manning Gorge, El Questro Wilderness park, The Bee Hive Domes of Bungle Bungles, in the comfort of your air conditioned 4WD coach! This is the best way to see all the highlights of the Gibb River Road plus the breathtaking panorama of the Mitchell Plateau. This adventure covers most of the major attractions between Broome & Kununurra. This is a tour you'll never forget..prepare for the adventure of a lifetime! Come for the ride of your life in our 750HP H1 Hummers. Our Fully Race Prepared H1 Hummers are fitted with 509 Cubic Inch Big Block Race Engines which spins all four wheels on bitumen! We have a total of Six (YES, 6) H1 Hummers which we use for racing, corporate events and adventure rides. This tour incorporates all of the major icons of the Kimberley. Starting in Broome, you'll visit Cape Leveque, Prison Tree, Gibb River Road, Windjana Gorge, Tunnel Creek, Manning Gorge and Galvins Gorge. Drysdale Station, Mitchell Falls, El Questro. We finally finish in Kununurra. The Bama Way is a 3 day tour from Cairns and Port Douglas north to Cooktown. The Bama Way links 3 Aboriginal-owned & operated tours operated by the traditional custodians. Each tour provides a unique experience which will teach you about different aspects of Aboriginal culture and life. 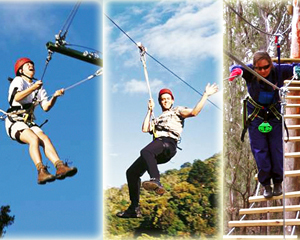 This thrilling full day adventure tour includes pick up and drop off, two large meals with drinks, 4WD rides, rainforest treks, a Flying Fox ride, a Tree Top Canopy Walk...and much more! Ready for some adventure? Explore Port Stephens (NSW's dolphin capital) on one day, then visit the Hunter Valley, the next day. Over the 2 days, we'll hand-feed sharks, go 4 wheel driving, sand surf down the famous dunes and indulge in delicious goodies of the Hunter Valley -wine, cheese, chocolate. Be part of a feel good community project in the heart of Arnhem Land in the Northern Territory! This project aims to work alongside and under the direction of the Yolngu Aboriginal Rangers, where you can be part of the team that helps to rescue marine wildlife facing environmental threats.